In its third raise for workers since 2010, Foxconn has decided to increase employee wages by another 16-25%. The company stated that a junior worker could now expect 1,800 Yuan ($285) per month and those with completed technical exams under their belts will receive as much as 2,200 Yuan ($349). This elevation of worker compensation took effect at the beginning of February, which seems like fortunate timing for both Foxconn and Apple as Fair Labor Association (FLA) inspectors have since begun auditing the conditions of Foxconn's facilities. The inspections are a result mounting pressure for Apple to act responsibly in the wake of worker abuse, injuries, protests and even suicides. Apple is the first technology company to join the FLA, an organization dedicated to ensuring the proper treatment of outsourced workers. There is little doubt this move was to help soften public ire regarding the recent onslaught of negative press. 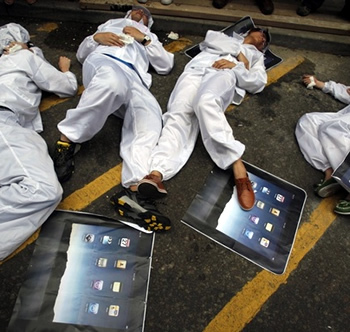 The FLA's preliminary snooping in Foxconn's iPad factory has revealed surprisingly positive work conditions. The organization's President, Auret van Heerden, described the plant as "first-class" and "way, way above average". He went on to say the environment was relatively low-intensity and workers do not seem unhappy. Keep in mind that Van Heerden's comparison is based upon the bar set by other Chinese manufacturers, which may not meet Western ideals of "first-class". Also, let us not forget the official inspection may vary from preliminary observations, so we'll have to wait for the final results before meaningful conclusions can be drawn. Wage increases are not uncommon for Foxconn and certainly welcomed by Foxconn employees. Merely three years ago, junior workers were paid as little as 900 Yuan. Fast forward to 2012 and wages have effectively doubled. Are better times ahead for outsourced workers?